We were able to get our third team on the road to Yushu this morning at 7:15am. Among the team were two doctors, three nurses, two logistics personnel, and two Yushu-born translators. The team should be arriving this evening around 10pm local time. Reports from teams already in Yushu indicate that the death toll will certainly continue to rise. Today overall our medical teams treated less acute wounds while seeing an increase in more general illnesses. The team was able to treat close to 140 patients with varying symptoms including stomach illness, dehydration, and high blood pressure. A few patients were delivered to the airport for medical evacuation. Our team members all reported stand-still traffic throughout Yushu due to increased rescue efforts and increased media coverage as well as a visit from the Chinese President, Hu Jintao. One team member let us know that the streets were lined with semi trucks filled with relief supplies, front end loaders, as well as a few industrial cranes which all added to the significant delays- but will undoubtedly aid the overall effort. Our team en route to Yushu saw very few cars leaving the city and heading for the provincial capital of Xining due to the significant delays in Yushu. In Xining, our staff continued organizing logistics for teams that will be heading out around the middle of this week. We plan to send a large truck down tomorrow to deliver much needed supplies such as mass water purification solutions, tents, medicine, food, and power generators. Our next team to depart will likely consist of additional doctors and nurses from throughout China. Plateau Perspectives and Yushu Earthquake Relief continue to find favor with the regional government, the Yushu government, and the Health Bureau in order to continue in the relief efforts. The Health Bureau generously provided us with another medical tent which increased our ability to treat patients. 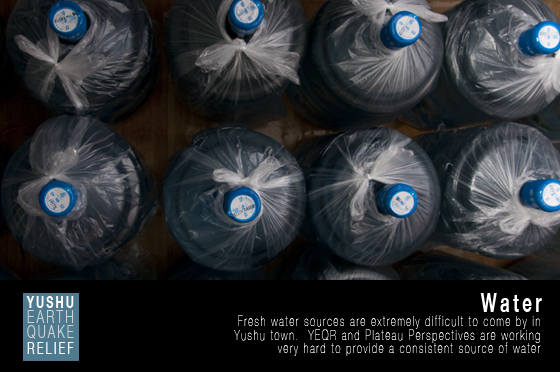 We continue to be thankful for the privilege to help relief efforts in Yushu.